Inside Out is one of my favourite movies too. It is a rich layering of some complex psychology, told through a wonderfully relatable narrative that is beautifully told. Inside Out is about the emotions that live inside us. Riley, an 11-year-old girl, moves from Minnesota to San Francisco, and the movie tells the story of her emotions as they deal with all of the conflicts and chaos that comes with adapting to such a big change. Well, that’s one way of putting it, but Inside Out is actually much much deeper. The story of Inside Out demonstrates that all of our emotions are needed in order to be a healthy human being. Joy thinks of herself as the primary emotion, and does her best to keep Sadness away from the control panel. Over the arc of the story, Joy learns that Riley needs Sadness too – that some problems can’t be solved with distraction or a pop-psychology pep-talk and positive attitude. By the end of the movie, Joy allows Sadness to take over, helping Riley to process all of the things she had been struggling with after the major life change of her move to San Francisco. This is what Dr Leaf was referring to, I think. Yes, sadness is part of healing from any major life change including grief. What Dr Leaf didn’t discuss was the role of the other emotions in Riley’s life. Yes, Joy and Sadness are important, but the movie demonstrated all the way through that Fear, Anger and Disgust were all just as important, and the end of the movie showed that Riley’s core memories, which each formed a different aspect of her personality, were various combinations of all of the emotions. But that’s not what Dr Leaf teaches. For decades, her teaching has been back-to-front, claiming that emotions like anger and fear are toxic, and that toxic emotions cause damage to your brain and damage to your health. She tells her followers not to think toxic thoughts or to have toxic emotions, but to take control of your thought life. If Dr Leaf is finally coming around to real science, then that’s great, but she can’t have it both ways … she can’t promote expressing your emotions on one hand and then suppressing them on the other. If she wants to come back to the fold of real science, then she’s going to have to renounce her previous teaching, and take it down from her website. Otherwise it ends up being conflicting and hypocritical as well as being downright confusing. 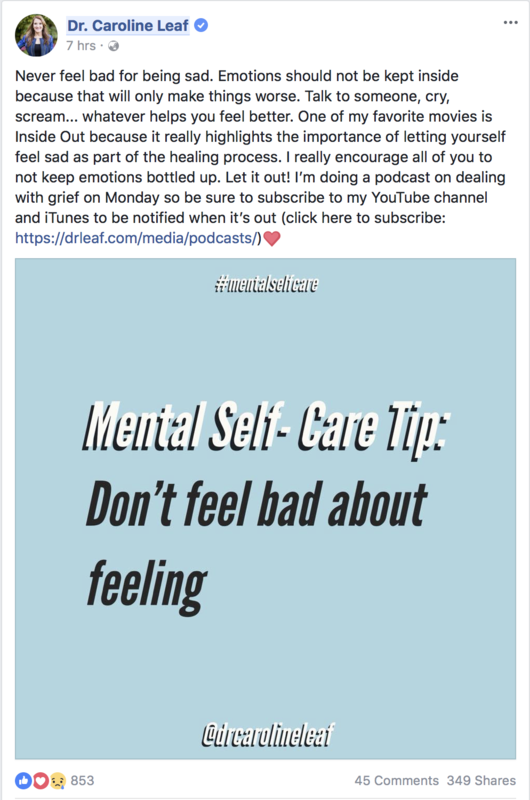 So, Dr Leaf, you’re welcome to use movies like Inside Out to illustrate good psychological principles, but if you want credibility, you should work on some consistency. Leaf CM. Switch On Your Brain : The Key to Peak Happiness, Thinking, and Health. Grand Rapids, Michigan: Baker Books, 2013. Skinner EA, Zimmer-Gembeck MJ. The development of coping. Annual review of psychology 2007;58:119-44. This entry was posted in Biological, Caroline Leaf, Psychological and tagged adaptive coping, caroline leaf, cognitive neuroscientist, criticism, false teacher, grief, Inside Out, joy, pep talk, pop psychology, positive attitude, pseudoscience, sadness, toxic thought by cedwardpitt. Bookmark the permalink.